Foxfire, the US printer which appeared on the cover of September&apos;s Printing Impressions magazine, recently took delivery of their new ROLAND 900 XXL machine. 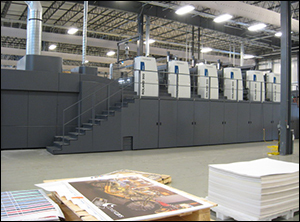 The retail specialist located in Newark, Delaware, USA is enjoying an economic expansion boom, fuelled by an $6.5 million capital investment that includes the new XXL press from Manroland as well as creating 38 new jobs. The Foxfire ROLAND 900 XXL with coating unit and extended delivery in format 8 was delivered with a suite of QuickChange optimization features and fully Automatic Plate Loading. Exclusive okBalance® and Low Coverage Stabilization software will enhance quality and provide efficient performance for the life of the machine. TelePresence, the Manroland remote diagnostic and maintenance software, provides a coordinated maintenance schedule and a quicker service response should it be required.